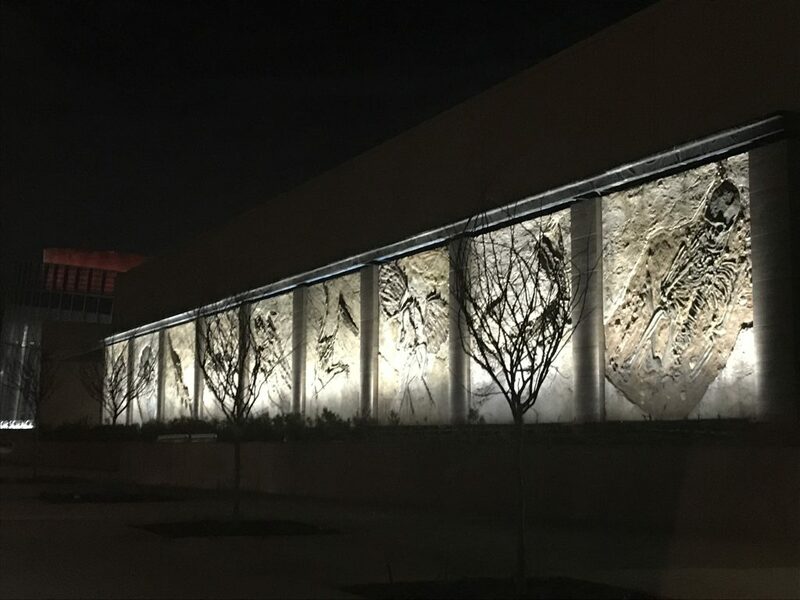 Exterior GFRC Fossil Panels at the ICR Discovery Center for Science and Earth History | Cost of Wisconsin, Inc. COST designers, artisans, and project manager Kris Arneson, worked together from the design stages though panel installation with Beck Architecture and the ICR team. Once the shop drawings were completed, scaled maquettes were sculpted per the approved photographic reference imagery. The masters were hand carved in a high-density polystyrene and molded to capture all the meticulous details. COST’s GFRC fabrication shop then pneumatically applied the lightweight concrete material into these molds. After the units were cast and cured, staffed artisans painted each panel in accordance with the approved photographs and maquettes. A topical aging solution was applied to each panel in order to provide the “ancient” fossilized finish. ICR’s website hosts a video of the installation process here. The project team included ICR staff, The Beck Group, Dallas-based LARC, and COST of Wisconsin, Inc.